Fantastic creative project to color and create a pillow masterpiece that will stand out in any bedroom. This fun pack comes with a single cotton pillowcase and 10 bright wash out pens so you can doodle, wash and re-doodle again and again. 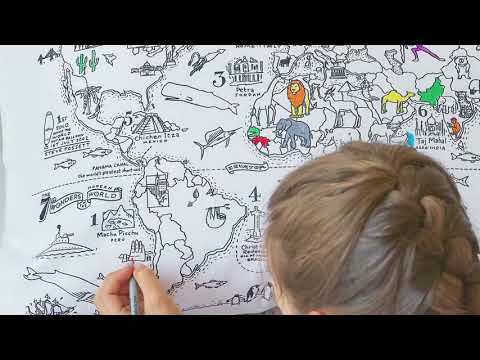 The map design features a beautiful, specially commissioned hand-drawn illustration packed full of fun facts, wild animals and exotic sea creatures. When you are done coloring, simply pop a pillow into the case, and proudly display your creation. An ideal way to add the special touch to a bedroom makeover - Geography homework has never been so appealing!